Rarely does a book come along where I am so excited and intrigued that I am compelled to request a copy to do a review. And even more rare is it for me to request a 500+ page book to review when I have my own writing to do, and tons of other reading to do. And then there is E.J. 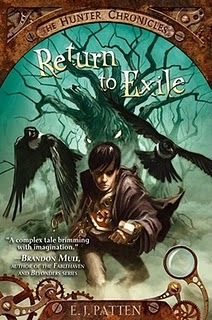 Patten’s RETURN TO EXILE, which I requested pre-release because it so looked like my kind of book. By “my kind” I mean a book that boys would like. Well, I wasn’t disappointed. Eleven years ago, a shattered band of ancient hunters captured an unimaginable evil and Phineas T. Pimiscule rescued his nephew, Sky, from the wreckage of that great battle. For eleven years, Sky Weathers has studied traps, puzzles, science, and the secret lore of the Hunters of Legend, believing it all a game. For eleven years, Sky and his family have hidden from dark enemies while, unbeknownst to Sky, his uncle Phineas sacrificed everything to protect them. But on the eve of Sky's twelfth birthday and his family's long-awaited return to Exile, everything changes. Phineas has disappeared, and Sky finds himself forced to confront the mysterious secrets he's denied for so long: why did his family leave Exile on that day so long ago? What, exactly, has Phineas been preparing him for? And, the biggest mystery of all, who is Sky really and why does everyone want to kill him?! Yeah, that’s an interesting summary, and the world Patten creates—which is, mind you, set in modern times—is well-rounded and fully formed. I love fantasy that is rooted in TODAY, so I loved that these characters were "real" modern kids, and I loved that I didn't need to weed through a million special characters to read the book (which is the case with many fantasy novels). The monsters in this book have ties to known beasts and creatures we might be aware of, as some are werewolf-like, for example, but Patten develops these monsters as all their own, giving detailed history in the form of anecdotes and mythology that helps to create a more vivid set of monsters. I found myself turning to the back of the book, where there is a sort of Monster Almanac that I found very, very cool (though I did wish there were some drawings of each monster included, since John Rocco’s cover art is awesome with a capital AWE)! I can't tell you how refreshing it is to read about a completely unique bundle of monsters, all of which Patten definitely put a great deal of time into fleshing out, as opposed to reading yet another vampire or werewolf book. Kudos to Patten for traveling down his own path and creating a new culture of creatures for young readers to be afraid of. The action in the story, to me, gets going a little late in the book, so I urge readers, especially young readers, to hang in there with a promise that it is well worth a little bit of a wait. Our hero, Sky Weathers, is a fully developed character, complete with heroic traits and his fair share of flaws. The cast of monster hunters also is rich, and reminds me of a sort of ARMAGEDDONesque cast. Finally, I think the thing that seals the deal for me is Patten’s writing, which is equal parts visual, fast-paced, and humorous. I found his style to be a sort of third-person Riordan, with hints of Brandon Mull. That’s a cool combo, y’all. Patten’s got some serious writing chops, so watch out for him in the future. "In his dying moments he didn’t want his last thought to be, Oh, my. What big teeth you have. Secretly he’d always wanted his last thought to be So that’s what poisoned chocolate tastes like!" The only qualm I have is related to the length of the book, and that qualm is related to me being a teacher. The book is over 500 pages long, which for many kids is okay, but the problem is that it limits the students I can recommend the book to because, to be honest, the simple fact that it’s that long will scare them almost as much as one of the monsters in the book. I will still recommend the book to most of my boy students, and tell them they’ll get lost in the story, but 500+ pages for a debut is a bit of a risk. Authors like Riordan, Mull, and MacHale, who I compare Patten to in style and plotting, have the established names that will draw young readers to a 500+ page book. I think Patten’s got that in him, but as a debut I think it might limit the audience a bit. I interviewed Patten over at my blog, so stop by and check it out HERE. Sounds like a winner. And you're right, that cover art is amazing! Oh man! This looks awesome. I mean steampunk border on the cover? Yes, please. On my way to the interview, thanks, Mike. Wow. Yes...sounds fantastic and I will be sure to get it, read it, share it. Thanks! Great review of what sounds like a super read! Thanks! I love the cover too. Sounds like an exciting book. 500 pages is way long for middle grade but sounds fabulous. Papa's Got a Brand New Bag! Meet our new member! First Novels: When to hold and when to fold?